Private Life, the surgically precise fertility comedy that debuted on Netflix last week, sneaks up on you both emotionally and comedically. The first line in the movie that made me burst out laughing was a brief exchange about 20 minutes into the film where Kathryn Hahn's character Rachel, a 41 year old playwright and author described as a "fertility junkie" by a family member, gets an odd question from her doctor right after he begins a complicated (and invasive) medical procedure. "You like prog rock?" he asks as the sound of "Say You Love Me" by John Lodge of The Moody Blues fills the operating room. Rachel, overwhelmed and befuddled, stares at the ceiling. There are multiple scenes in this brutally funny movie that end on similar deadpan, offbeat notes. 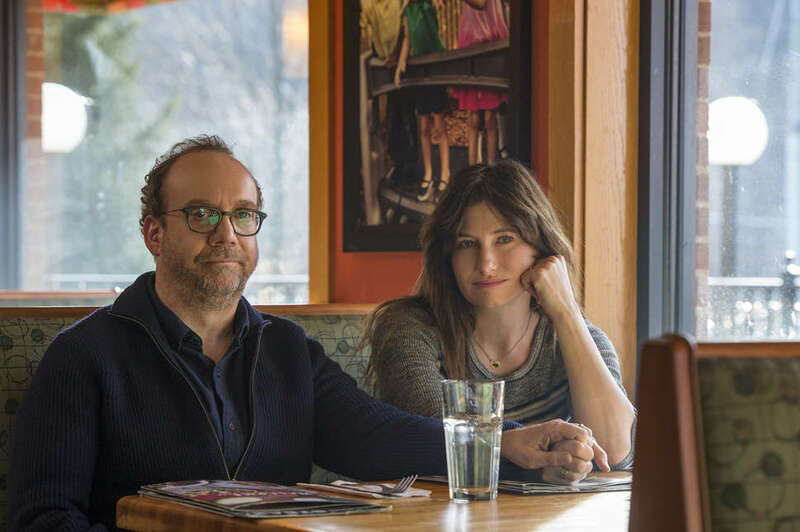 In chronicling the story of Rachel and her husband Richard, played with dogged sensitivity by Paul Giamatti, Private Life constantly asks you to consider the shifting social boundaries and evolving conversational codes that surround reproduction and family planning. Is it inappropriate to casually mention that your husband has one testicle? How does one assess a potential egg donor without sounding creepy and dystopian? What should be left unsaid? In the work of writer and director Tamara Jenkins, making her first feature since 2007's similarly unsparing The Savages, the unsaid often gets said in outbursts of verbal fireworks. Insults fly like bottle rockets; truths explode and fill rooms like smoke bombs. Rachel and Richard's East Village apartment, with worn-out books stacked in the fireplace and explicit paintings made by friends hanging on the walls, becomes an emotional foxhole, a retreat from the sterile, science-fiction like interiors of doctor's offices and waiting rooms. But even in the foxhole, no one is safe. The first section of the film is divided into chapter-like passages with foreboding on screen titles -- "The Retrieval," "The Transfer," "The Home Study," "The Test" -- and they help the viewer understand the highly regimented demands of the situation. While it's never made completely clear why Rachel and Richard want a baby, we quickly understand they've taken a wide-reaching approach, pursuing In Vitro Fertilization and adoption. When we meet them, they're already questioning their own choices. "We're not insane," says an exasperated Richard to Rachel early on. "We're normal." He clings to a mantra for stability: All they need is one good egg. Eventually, they become convinced that Richard's 25-year-old niece Sadie (Kayli Carter) might have that egg. (Yes, it's complicated: Richard's brother is Sadie's step-father, so they're not technically related.) Sadie, an aspiring writer who recently took a leave of absence from Bard, much to the chagrin of her mother Cynthia (Molly Shannon), is the movie's broadest comic creation. Unembarrassed and undaunted, she has the performative cynicism and half-formed opinions of a young person raised in the privilege of suburbia but yearning for an idealized, outdated version of life in a big city. Jenkins gives her withering takes about the literary magazine Tin House and irony-soaked lines about cherished cultural artifacts. "I thought everything was supposed to be all gentrified now," she says when she arrives in Rachel and Richard's neighborhood. "It's so Serpico." Eventually, the trio of Rachel, Richard, and Sadie, the willing surrogate, create their own makeshift family as they bond over injections, prescriptions, and appointments. There's a lyricism and nimbleness to Jenkins's visual approach, which incorporates cell phone footage for montages and uses an extended flashback to tell a painful story of a failed adoption. Undoubtedly, the dialogue is the main selling point of a talky and neurosis-soaked comedy like this -- Hahn especially excels in the many carefully worded arguments -- but the imagery is also striking and often quite moving. A single shot late in the film of Giamatti quietly deflating an air mattress in the apartment has a profound beauty to it. You feel deeply for him precisely because the action is so drably familiar. As movie theaters fill with bombastic award season hopefuls this fall and Netflix itself attempts to win you over with its latest genre movie of the week, it's easy to imagine how a movie like Private Life would get lost in the shuffle. The algorithm might not serve it up as aggressively as its horror titles this month. That would be a shame. This isn't even a "small" movie in the way people sometimes (unfairly) dismiss stories about relationships and family life. In its commitment to documenting the specificities of its characters' lives and their ongoing struggles, the film takes on a sprawling quality. If you follow the movements and digressions over a long period of time, you'll be rewarded. Not unlike a good prog rock song.